We here at Birch Fabrics, have been incredibly blessed to work with Jess of Craftiness Is Not Optional. Jess joins us here again, to bring you a ridiculously adorable reversible wrap top inspired by our Eiko collection by Jay-Cyn Designs. The japanese kimono style wrap, will be loved by moms for its effortless style, and loved by daughters for it’s cuteness of course! Without further adieu, we are so honored to hand the reins over to Jess of Craftiness Is Not Optional! Hey fellow fabric lovers! 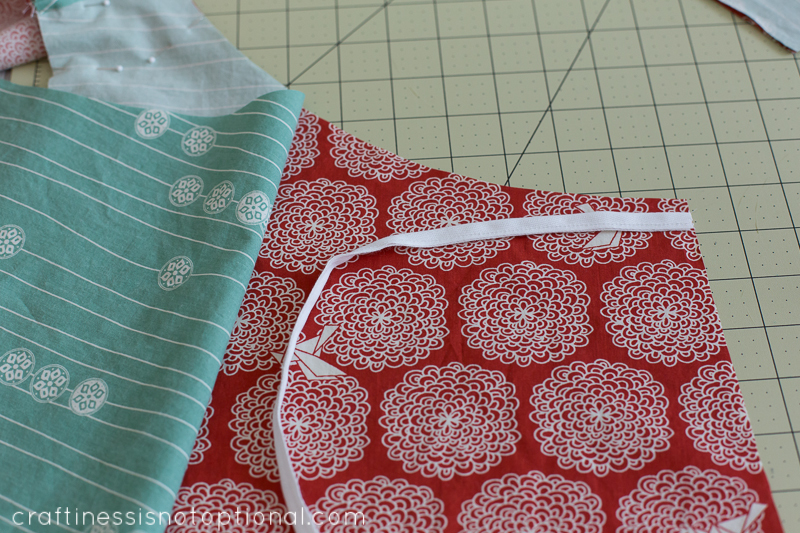 I’m Jess, from Craftiness is not Optional, and I’m so excited to share this top with you! 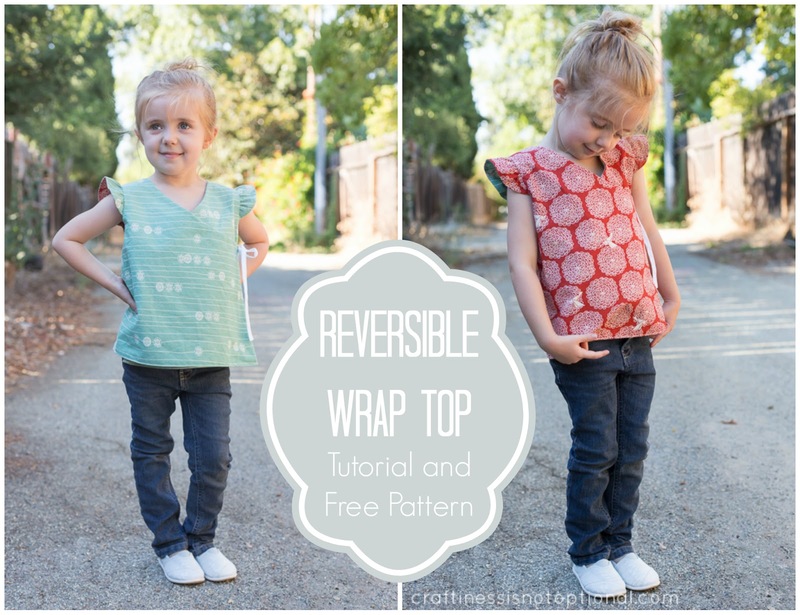 It’s a reversible wrap top with cute little flutter sleeves! And as a bonus-I have created a free pattern for you to use! (available in 3 sizes, download it HERE!) 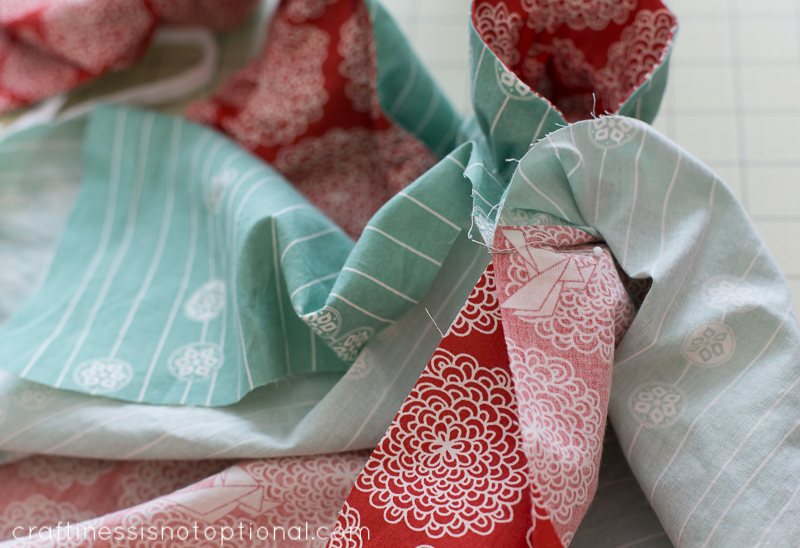 I got to play around with the gorgeous new Eiko line from Birch Fabrics. It’s organic cotton-I love this stuff. It’s got a great feel and drape and was perfect for this little wrap top. Their fabric is produced from 100% organic cotton, and printed with low impact dyes. 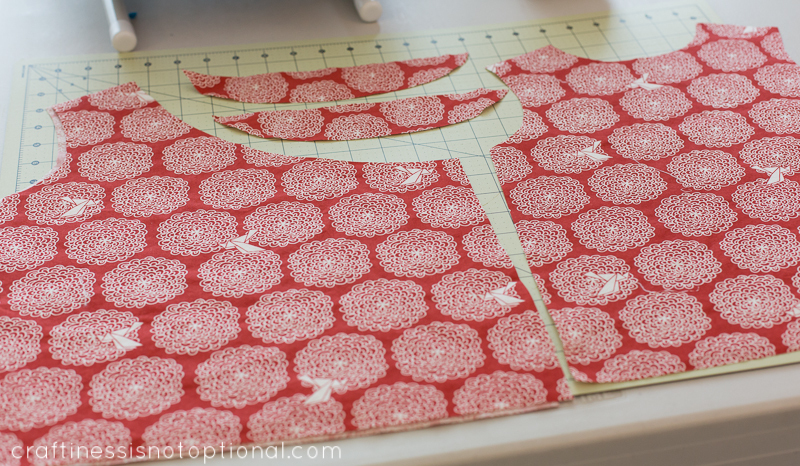 I used Stamp Stripe in Pool, and Birds & Blossoms in Paprika to sew up this top! My little gal LOVED that she got two tops in one-she seriously couldn’t decide which was her favorite. I’m partial to aqua, but I’ve got to admit, the red totally won me over! So here’s how I made it! It’s really quite easy! First, the pattern. 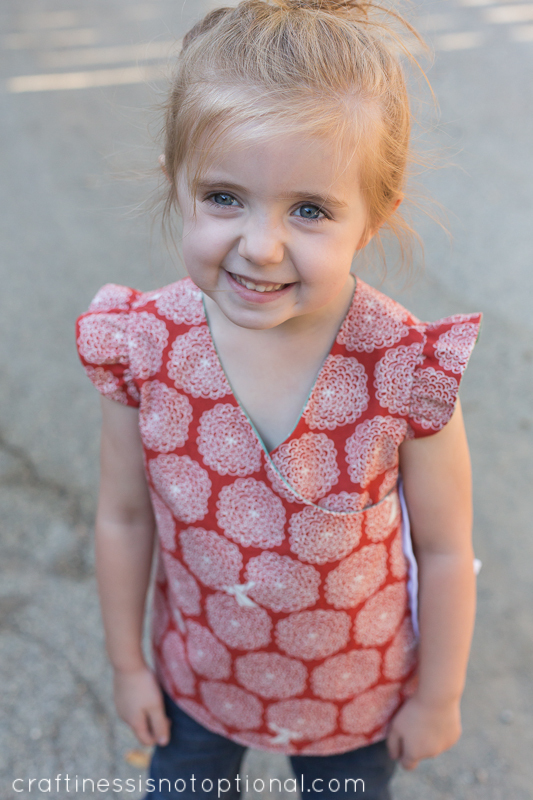 You can download my Free Pattern (in sizes 12-24 mo, 2/3T, and 4/5) or make your own. 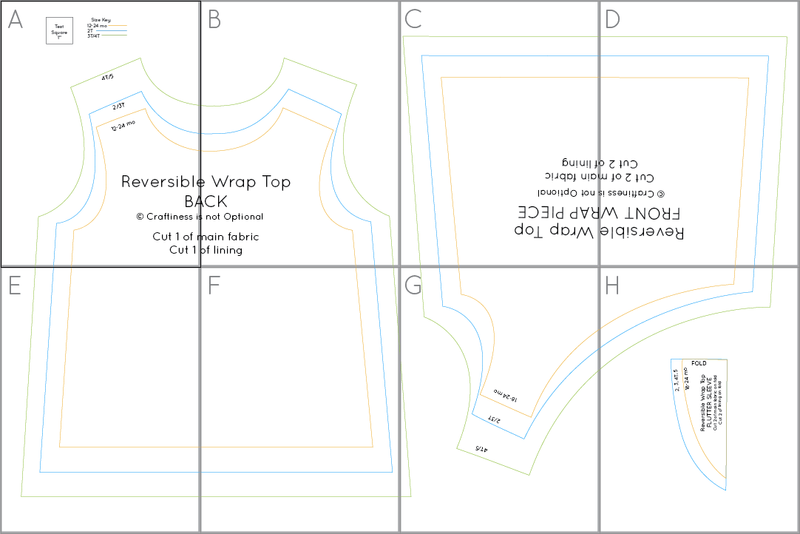 Here’s a printing guide for taping the pattern together! Print at 100%, no scaling (there is a 1″ box to check on the first page before you print out the rest), cut at the grey lines, and then piece and tape together like the pic below shows! 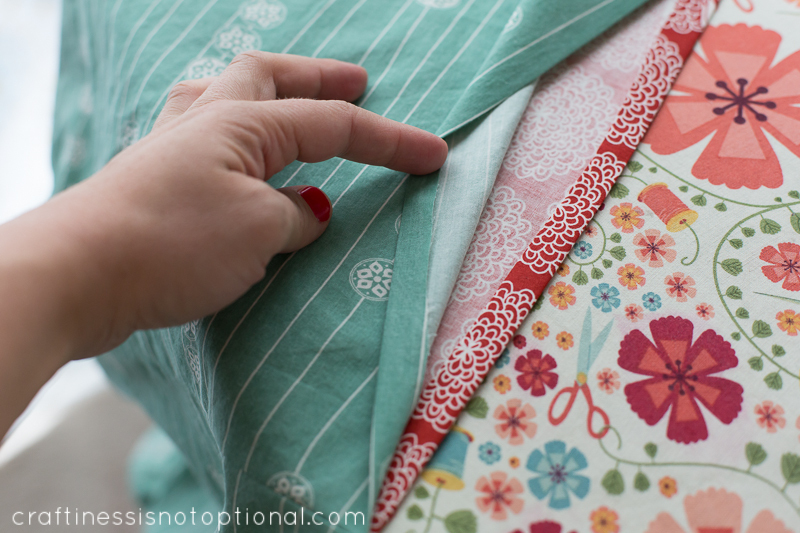 Seam allowance for the pattern is 3/8″ unless otherwise specified! This is what you should have, roughly. 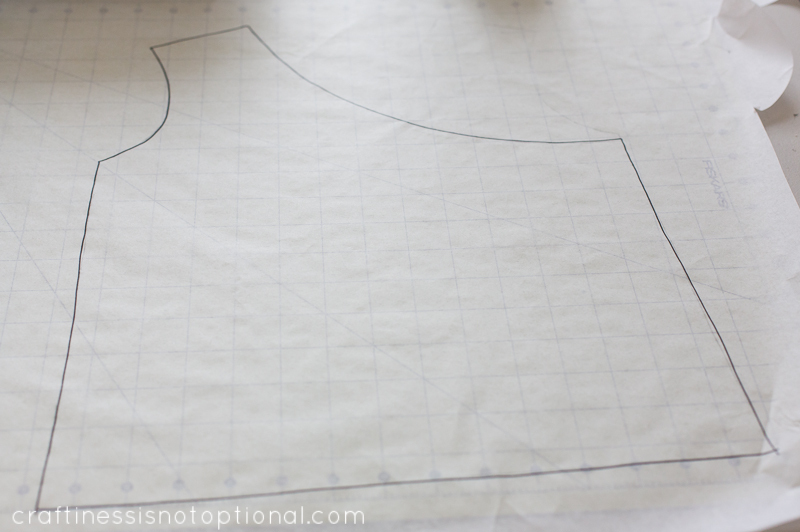 Trace around the back pattern, only omitting one of the shoulders and creating a curve from the inside of one shoulder seam, down to 3/8-1/2″ below the bottom of the armhole. 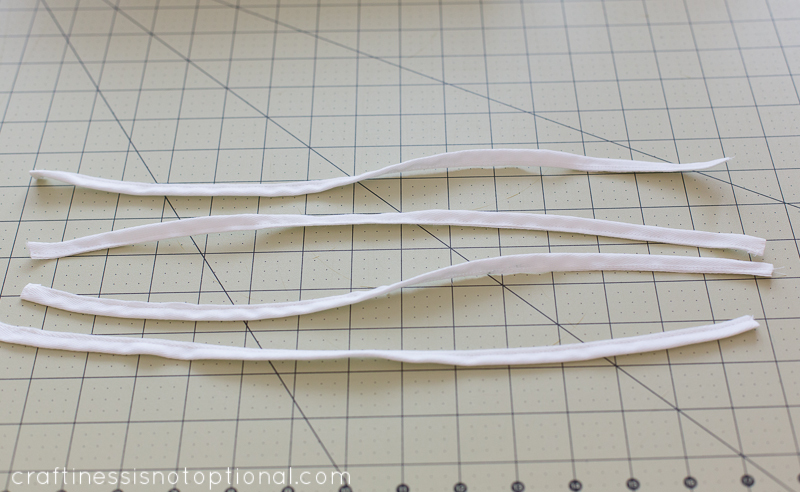 Also trim off about 1/2″-3/4″ from the side like so. 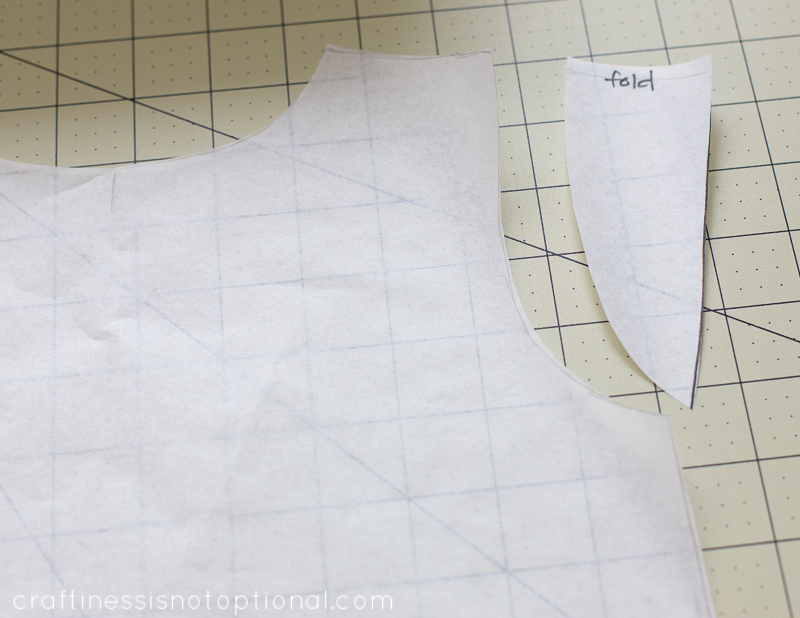 Then cut out from BOTH the main fabric and lining: 2 front wrap pieces, 2 flutter sleeves, and 1 back piece. Also four 12-15″ pieces of ribbon, bias tape, or twill tape. I used the 15″ length for the 4/5 size. I used some twill tape folded in half and sewn together. 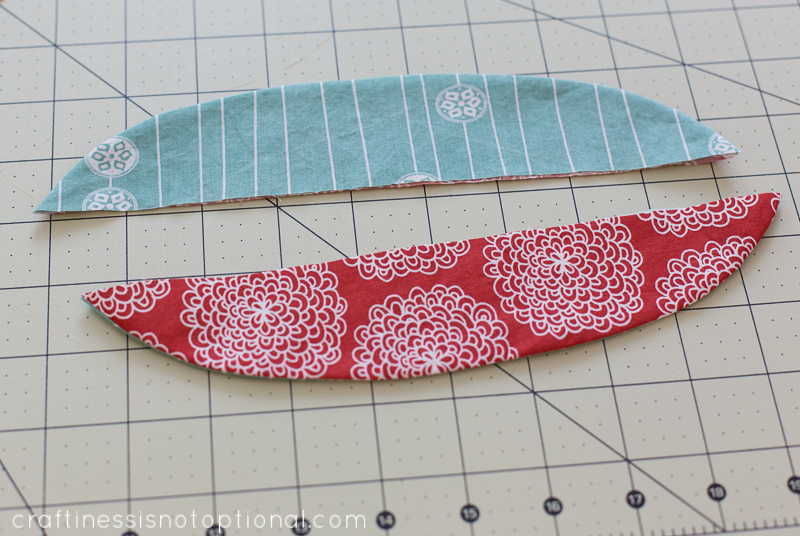 First pin the main fabric and lining flutter sleeves right sides together, and sew around the curved edge with a 1/4″ seam. Turn right sides out and press, taking care to get the edges pushed out and pressed evenly. 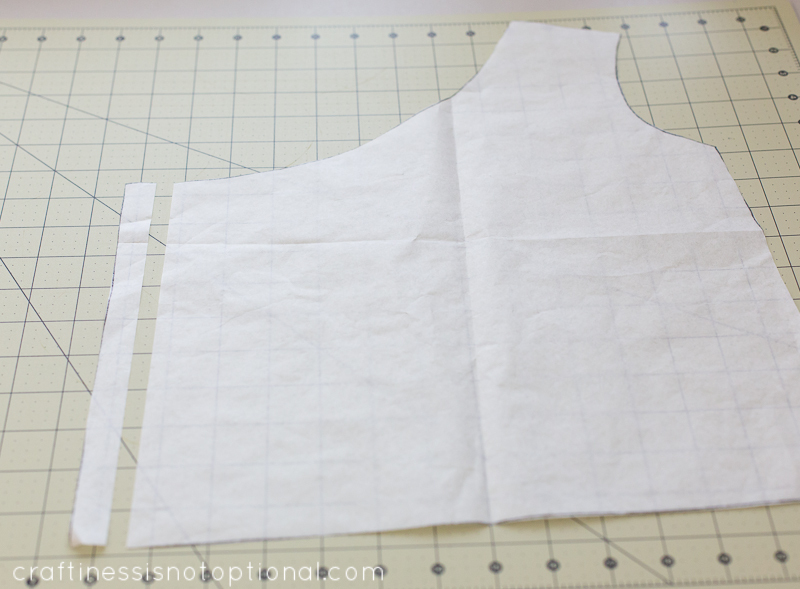 Pin the front and back pieces together at the shoulders, for both the main fabric and lining pieces. 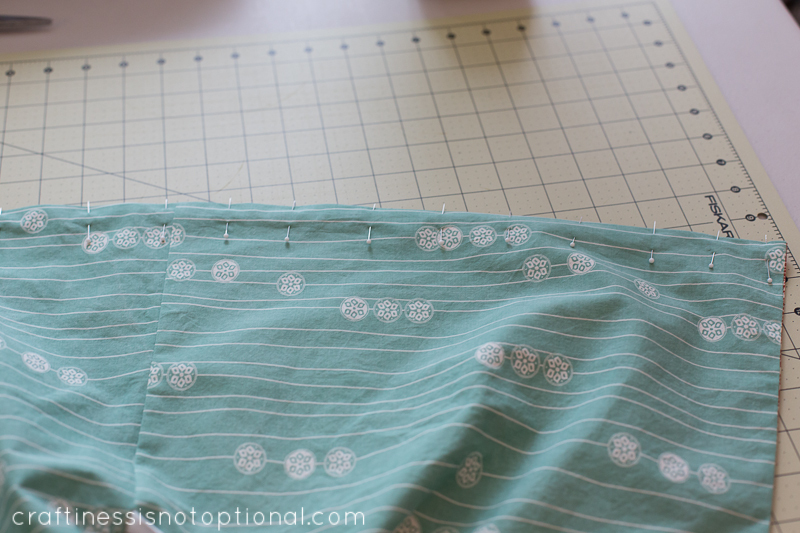 Sew shoulder seams and press open. 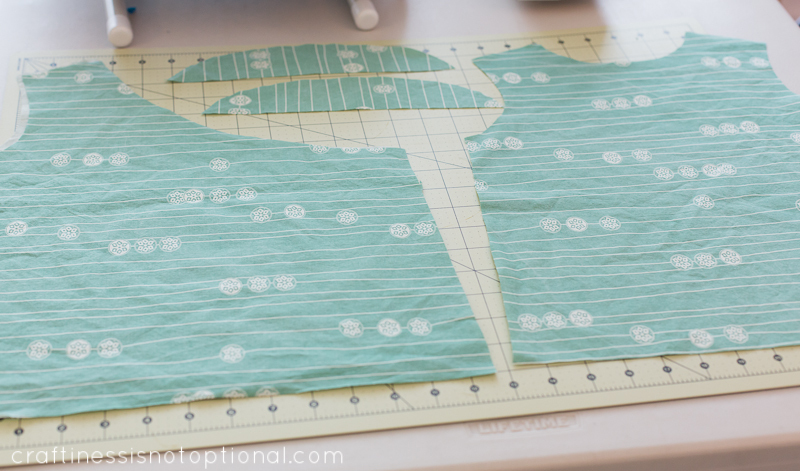 Sew a gathering stitch along the straight edges of the flutter sleeves and gather so that they’re the same length. 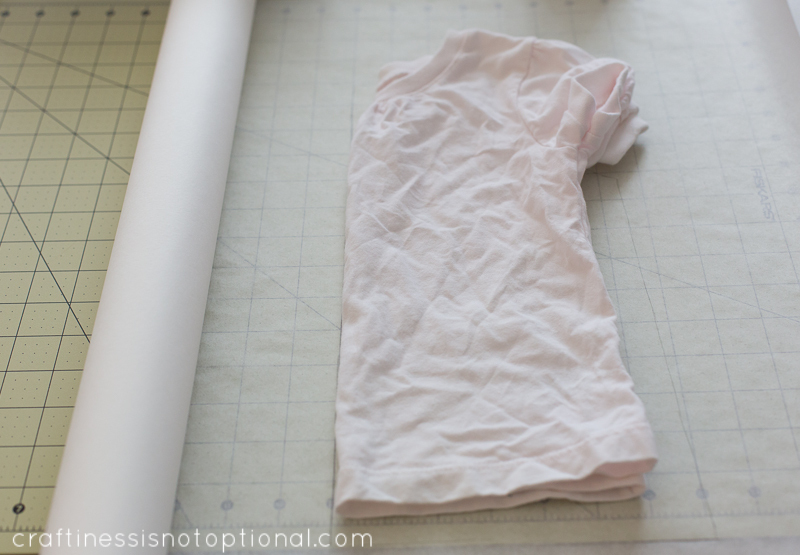 The sleeves will not extend down to the bottom of the armhole…just eyeball it so it looks good to you! 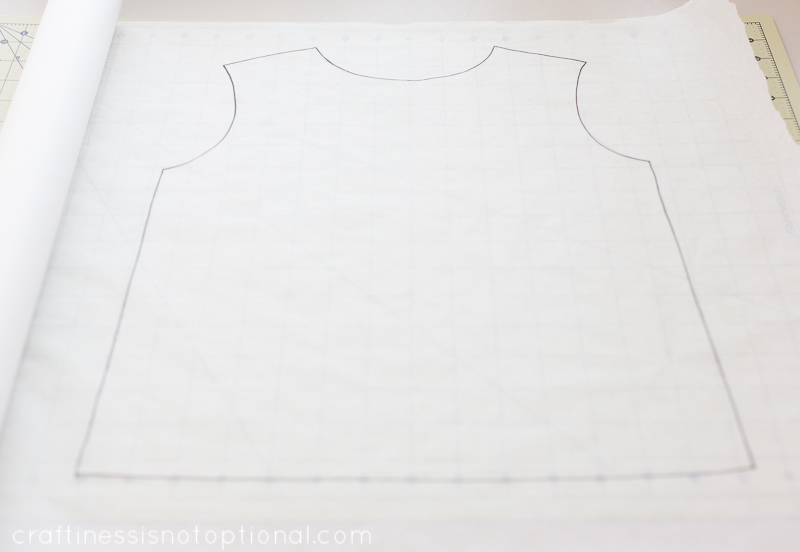 Lay out one of the bodice pieces like so-then matching the fabric right sides together, lay out the flutter sleeves on top. 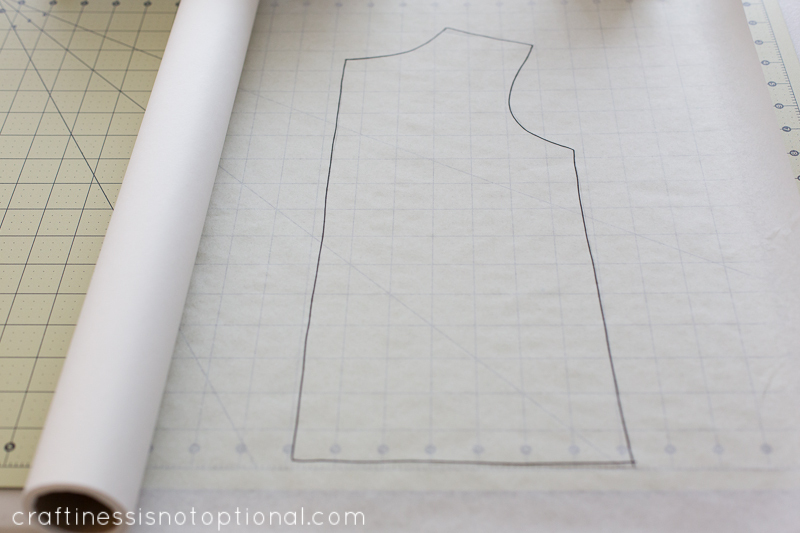 Pin together, starting with matching the middle of the flutter sleeve and the shoulder seam first, then pinning the sides down. Baste in place. 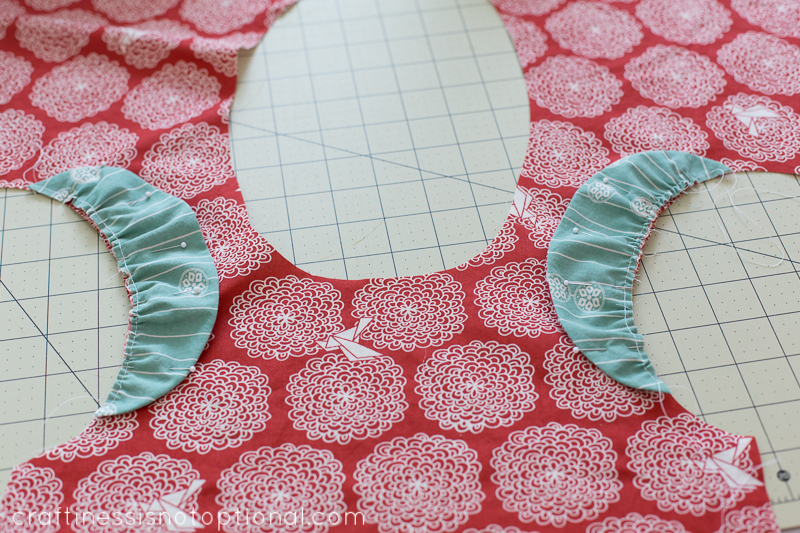 Layer the other bodice piece on top of the previous piece and pin together at the armholes and neckline like so. 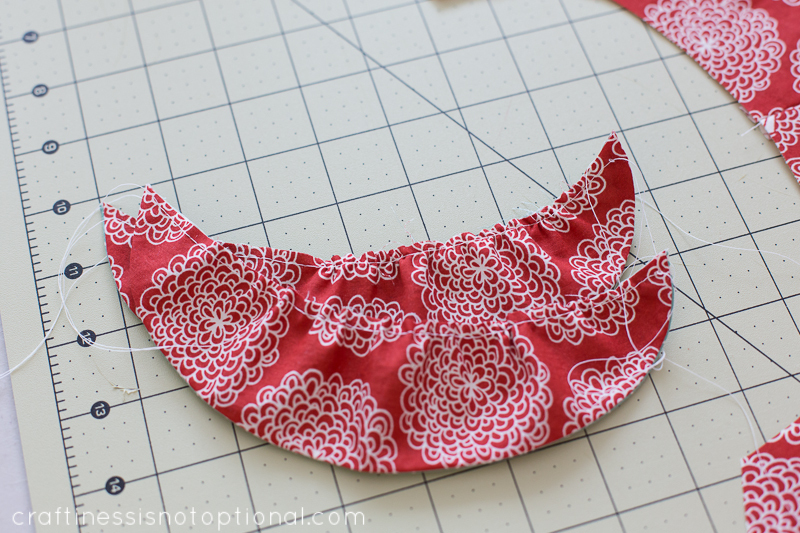 Sew around the armholes, fronts, and neckline of the top like so. Clip corners and curves as needed. Turn right side out by pulling the two front wrap pieces through the open back. 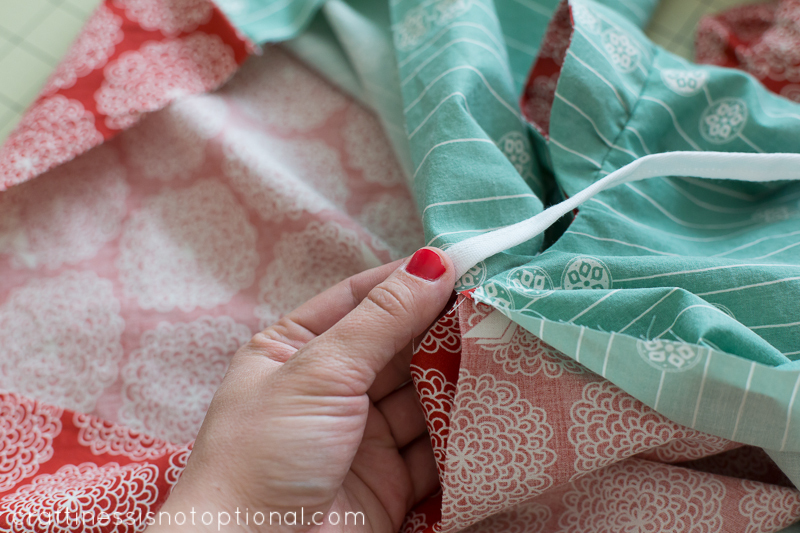 Then press carefully around the seams you just created-take care to roll out the fabric with a chopstick or your fingers to get a nice crisp and even pressed edge. 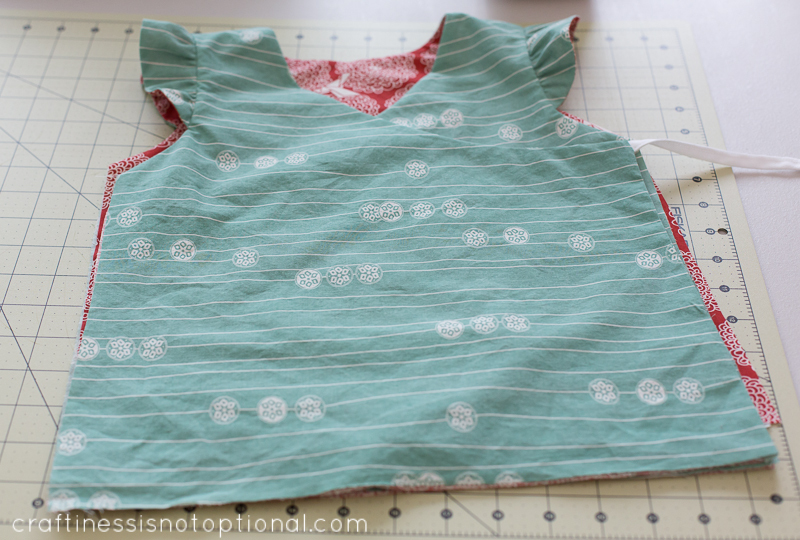 Next open up the side seams on one side of your top. Match up the seams like so and pin. Next pin one of the ties in place 3/8″ below, or above depending on how you are looking at it, the seam-main fabric first. 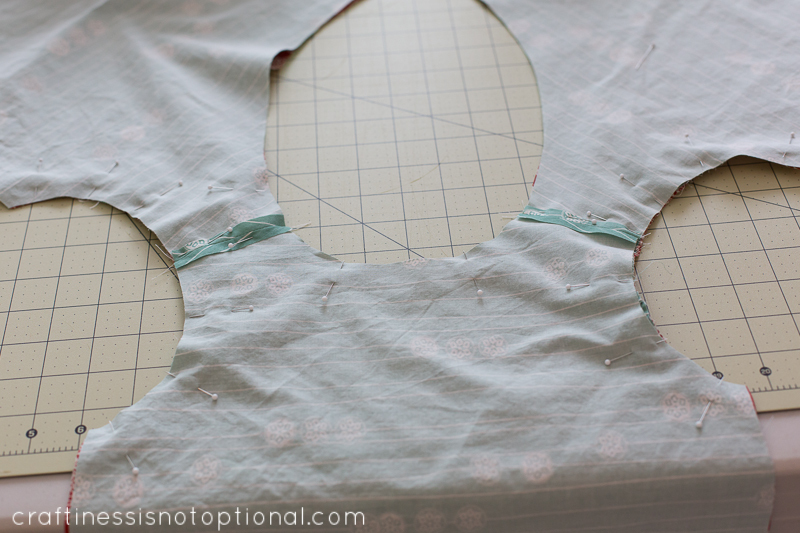 Continue pinning the sides together and sew. 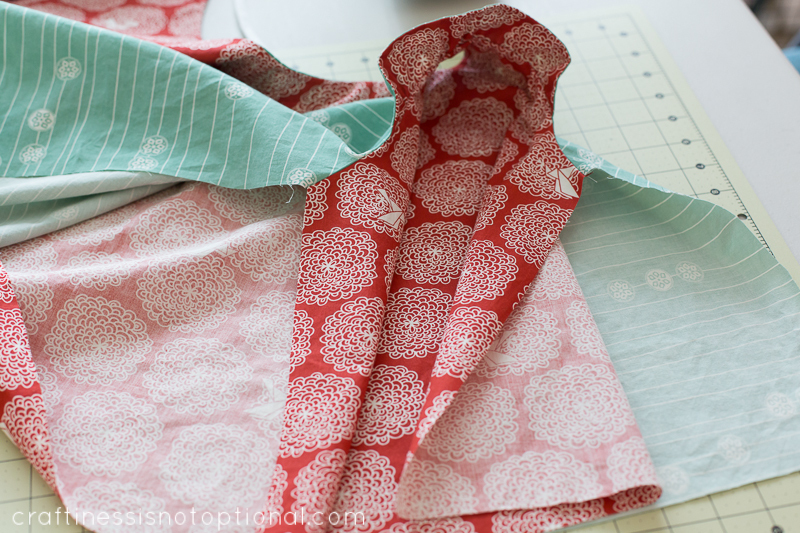 Repeat with the other side of the top, only sew the tie into the lining fabric the same way. Turn right sides out and press. Next turn up and press the bottom up 1/2″ like so-taking care to match up as evenly as possible! Pin and sew 1/8″ from the edge! Thank you sooooo much Jess for your creative talent and spirit! Head over to Craftiness Is Not Optional for a ton more eye candy! I just love this pattern! Thanks! Is the seam allowance included in the pattern? 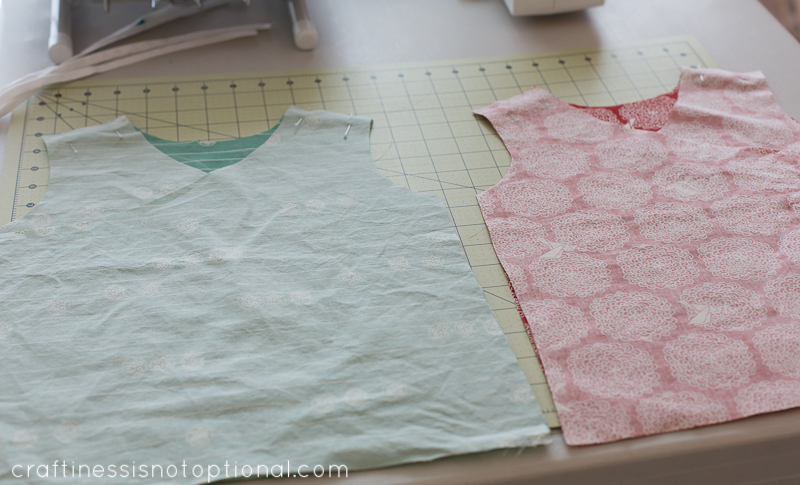 Planning to make matching tops for my nieces. So fun! What is the yardage needed for size 4/5? I've come across from CINO – am bookmarking this to make soon. Thanks for a wonderful tutorial Jess. Dave and Cami-I used about 3/4 yard each fabric for the size 4/5, but a yard each just in case would cover you. Thank you so much for this wonderful pattern. I can't wait to make my sweetie some new tops for Kindy! Great pattern!Thank you so much for it! Exactly what I've been looking for. Thank you. So excited to sew up a few for my daughter. Thank you all for checking out Jess's amazing pattern! Seriously so cute! Got an adult version? My only question is; Does the tie from the reversible side show if not in use? Haven't made it yet… trying to wrap my mind around how that works. Really cute… I need to make some for my grands. Hmmmm, never mind I think I've got it figured out. What is the yardage requirement for the 12-24 month size? So cute, an you give details on the seam allowance? What is the width and is it included in the pattern? Thanks! 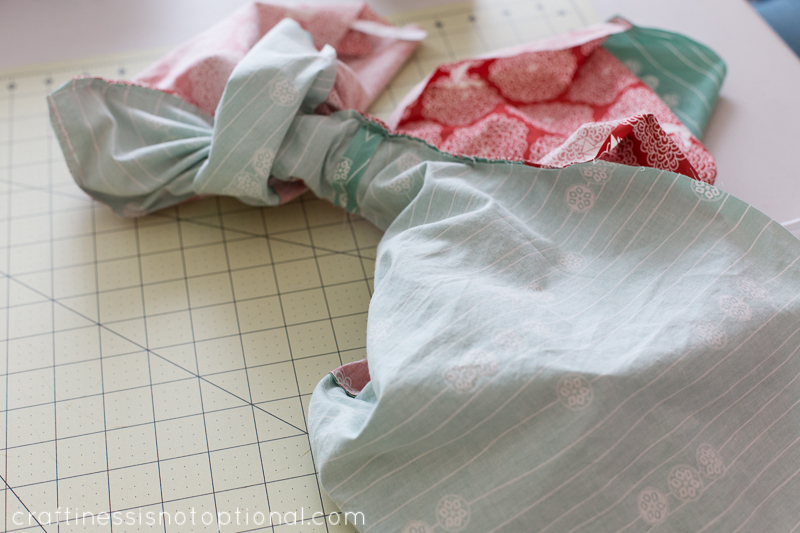 You could totally do a ruffle at the bottom to hide any "mismatched" hems! Hello…I am a complete beginner so sorry if this is a daft question! In your step 'Sew around the armholes, fronts, and neckline of the top like so.' 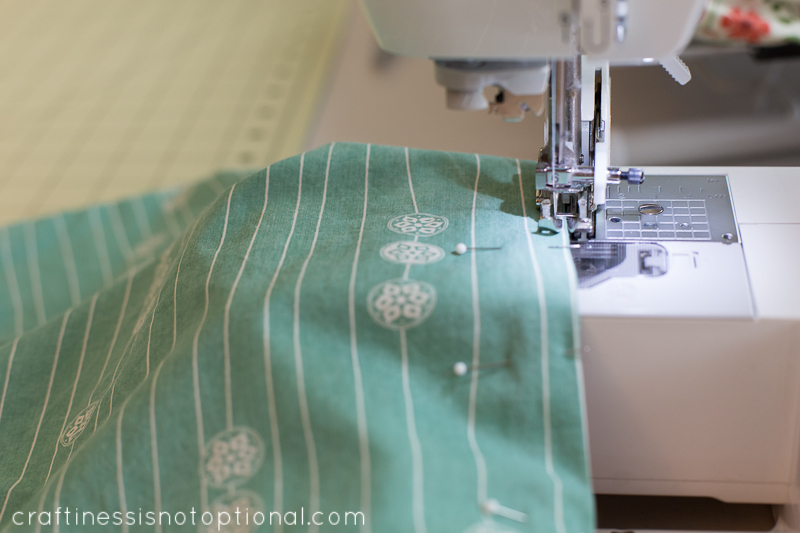 Do you sew along the white lines in the picture? I'm having problems turning the top inside out :S Thanks! Can you please help me? I can't get the pattern to down load. The Google doc. doesn't show anything. Thanks for sharing! My niece would love this! @kimmartucci, I'm not Jess, but thought I'd answer your question. 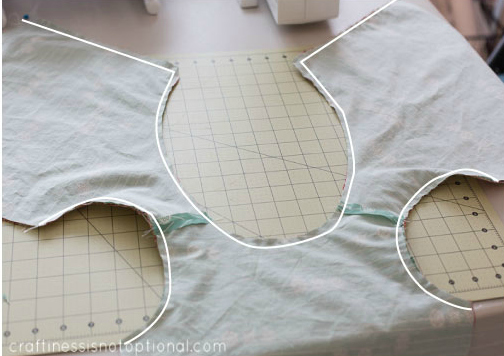 Usually an instruction telling you to cut 2 pieces from one pattern piece involves laying the pattern piece down on two pieces of fabric with the wrong sides together (or right sides together – either is fine) and then cut the piece from both layers at the same time. That way, you get your 2 pieces that will be mirror opposites of each other. 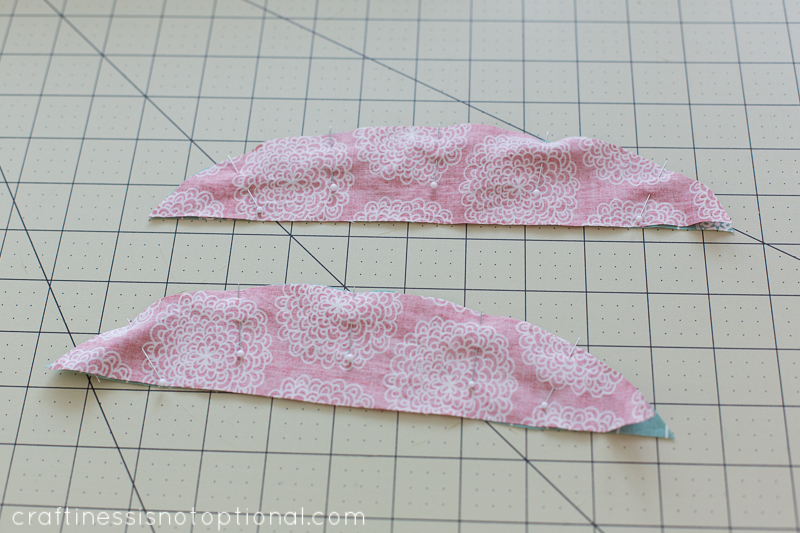 You can cut them separately (like you suggested), but it's easier to cut them at one. 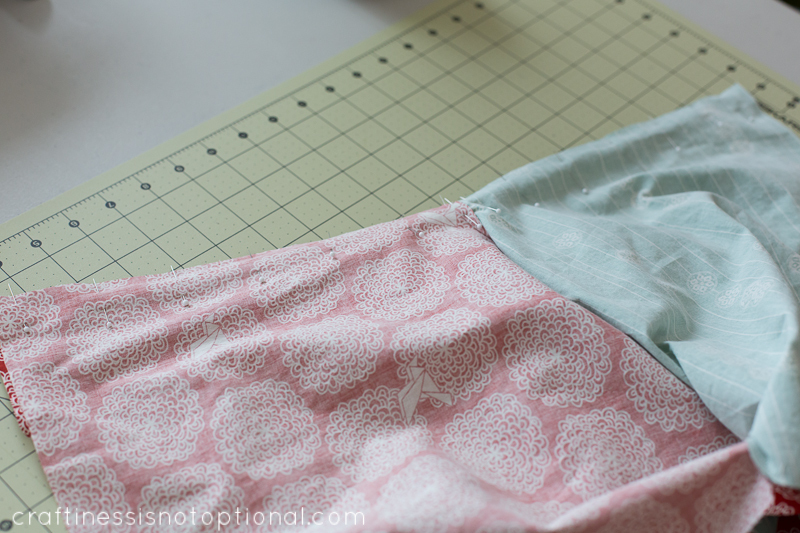 Once you have cut the 2 pieces from your main fabric, you would then cut them (using the same method) from your lining fabric. Saying match up the seams "like so" was not clear and I had to rip out the sides and try again. Finally got it.